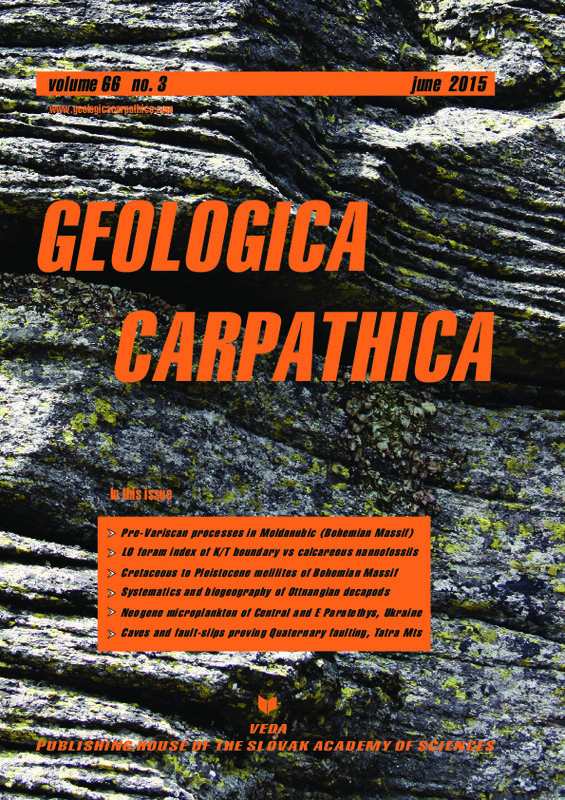 Abstract: Upper Cretaceous to Pleistocene volcanic rocks of the Bohemian Massif represent the easternmost part of the Central European Volcanic Province. These alkaline volcanic series include rare melilitic rocks occurring as dykes, sills, scoria cones and flows. They occur in three volcanic periods: (i) the Late Cretaceous to Paleocene period (80—59 Ma) in northern Bohemia including adjacent territories of Saxony and Lusatia, (ii) the Mid Eocene to Late Miocene (32.3—5.9 Ma) period disseminated in the Ohře Rift, the Cheb—Domažlice Graben, Vogtland, and Silesia and (iii) the Early to Late Pleistocene period (1.0—0.26 Ma) in western Bohemia. Melilitic magmas of the Eocene to Miocene and Pleistocene periods show a primitive mantle source [(143Nd/144Nd)t= 0.51280—0.51287; (87Sr/86Sr)t= 0.7034—0.7038)] while those of the Upper Cretaceous to Paleocene period display a broad scatter of Sr—Nd ratios. The (143Nd/144Nd)t ratios (0.51272—0.51282) of the Upper Cretaceous to Paleocene rocks suggest a partly heterogeneous mantle source, and their (87Sr/86Sr)t ratios (0.7033—0.7049) point to an additional late- to post-magmatic hydrothermal contribution. Major rock-forming minerals include forsterite, diopside, melilite, nepheline, sodalite group minerals, phlogopite, Cr- and Ti-bearing spinels. Crystallization pressures and temperatures of clinopyroxene vary widely between ~ 1 to 2 GPa and between 1000 to 1200°C, respectively. Nepheline crystallized at about 500 to 770°C. Geochemical and isotopic similarities of these rocks occurring from the Upper Cretaceous to Pleistocene suggest that they had similar mantle sources and similar processes of magma development by partial melting of a heterogeneous carbonatized mantle source.